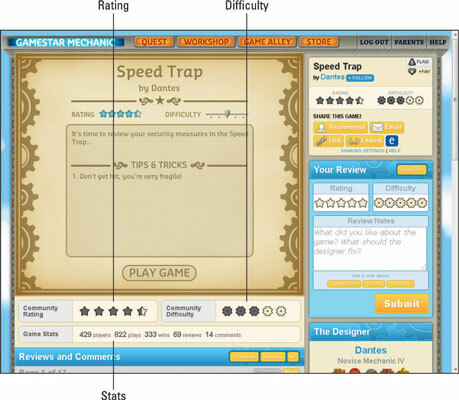 To find a fun game on Gamestar Mechanic with a difficulty level that’s right for you, examine the game’s rating and statistics. You generally want to look for games with a large number of stars — you can also check the number of wins to see if the game is particularly easy or hard. If you’re a beginner, try finding games with almost as many wins as plays. You can also look for games with a difficulty rating of 3 or less, though this rating is sometimes misleading. It’s a well-received game. Four and a half stars is a good rating, often indicating clever gameplay and well-balanced components. This game has 69 reviews, which is more than enough to provide a trustworthy verdict. Games with at least a few reviews generally produce meaningful star ratings. It’s a moderately difficult game. Because this game had 822 plays and 333 wins, every attempt at playing it had about a 40 percent chance of being successful. Also, because the game has a difficulty rating of 3 gears out of 5, it’s probably a moderate challenge. You could win or lose. Whether or not you’re successful at playing a particular game, you can always learn from the experience. Most players tried the game more than once. A total of 429 players attempted the game 822 times, so the average player made about 2 attempts at the game. Examining these two numbers is useful for understanding how most players play this game.